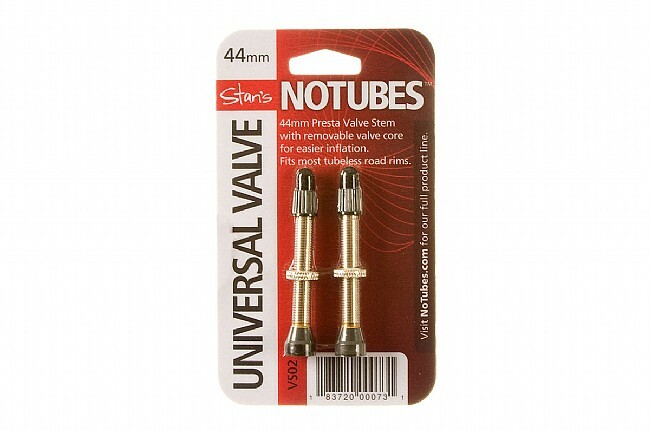 Tubeless valves for your road bike. Stans' new Road Valve Stems are required for tubeless conversion using the old taping method on non-tubeless rims, or can be used as replacement valve for many tubeless rims. At 44mm long, they accommodate most road rim depths, except for extremely deep aero wheels. A removable valve core provides easier tire sealant application and hassle-free extender installation. Fits up to an 8mm valve hole. Sold in pairs.